In my house, it’s glaringly obvious when my 2-year-old hasn't gotten enough sleep. On those dreaded days, my normally sweet and spunky toddler turns into Mr. Evil Crank Monster, who whines, tantrums and irritates in a single bound. Ugh. But not all kids are quite so obvious about their need for sleep. Not sure whether your kiddos are getting enough rest? We asked top sleep experts to share the signs—and the solutions! Late afternoon becomes a nightmare. Think 4 to 6 p.m. is simply your toddler's fussy period? Think again. Tots ages 2 to 4 who are consistently getting enough rest shouldn't have regular whiny witching hours, says Dr. Marc Weissbluth, author of Healthy Sleep Habits, Happy Child. Toddlers who aren't getting enough sleep, on the other hand, "will have a change in their mood, personality and behavior between 4:00 and 6:00 p.m.," he says. Consider yourself warned. She naps in the car. "One sign that your little one isn't getting enough sleep is if she falls asleep on car rides, especially on short car rides," says Dr. Jodi Mindell, author of Sleeping Through the Night. Toddlers ages 1 to 3 generally need 12 to 14 hours of sleep, Mindell says, while preschoolers ages 3 to 5 need between 11 and 12 hours. He has ants in his pants. Toddlers are notorious for not sitting still, but if your little guy is even more antsy than usual—not sitting still at a time (and for a duration) when he normally can, for example—he may be sending the message he needs more rest. "They move around more because they're trying to fight sleep," says Weissbluth. Plus, he says their little bodies are producing stimulating chemicals including cortisol and adrenaline to try and stay awake. He's got a short fuse. Toddlers and tantrums go hand in hand, but if you notice your tot progressing toward more fussiness, brattiness or tantrums—say, a falling block tower sends him into a tailspin—sleep deprivation may be to blame, say both Mindell and Weissbluth. She's super clingy. Think your tot is sticking to you because she's shy (or loving)? Not necessarily! Clinginess and increased dependency can be signs of exhaustion, Weissbluth says. He's having trouble sharing. "Sharing, taking turns and more well-developed social skills become impaired with children who chronically lack sleep," Weissbluth says. Tune in to any messages from teachers and observe your kiddo with peers. Have him hit the pillow if you see any social backsliding. She's struggling in school. Studies, including this one cited by the National Science Foundation, show that sleep deprivation in older, school-age children can lead to cognitive impairments. She's losing the gift of gab. "School-age children who have enough sleep tend to be animated, vocal and expressive," says Weissbluth. So if your normally talkative child starts dropping out of conversations, it might be a bedtime issue. Have a consistent bedtime routine. "Whether your child is 2 or 10, a bedtime routine is essential," says Mindell, who explains that children need to wind down from the day and benefit from clear expectations. "Make a bedtime chart that shows all the steps of your bedtime routine—such as a bath, brush teeth, pajamas and then two bedtime stories. Be as specific as possible." Make bedtime earlier. Weissbluth says 90 percent of 2-year-olds in his practice go to sleep by 7 p.m., and that when you sleep is even more important than duration because of natural circadian rhythms. 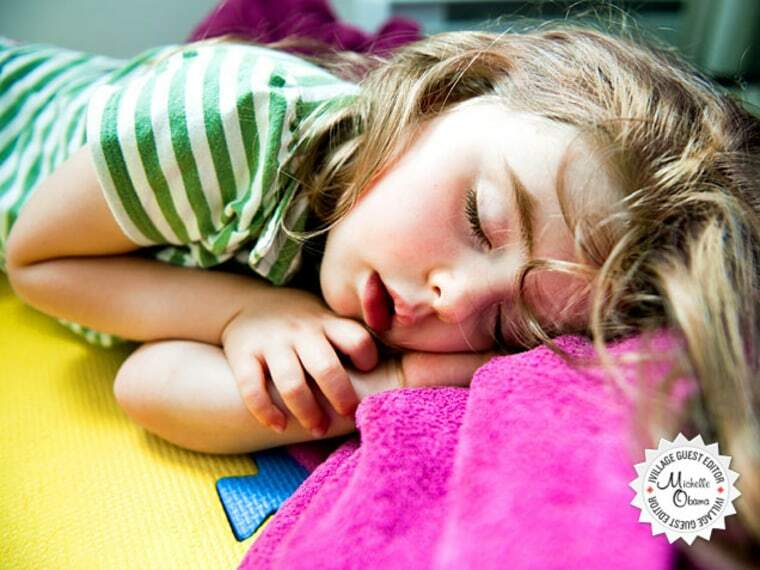 Set good sleep habits early by getting your kids in bed at a reasonable hour—when they're still relatively compliant. Use a bedtime pass. "Provide your child with a 'bedtime pass,' which is simply an index card that you have decorated together," suggests Mindell. "After lights out, your child can turn in the pass for one more request, such as another kiss goodnight, a drink of water, or a last trip to the potty. This way you're not second-guessing whether she actually needs to go to the bathroom again and there are clear limits. No more bedtime pass, no more requests." Help your child learn to self-soothe. Many kids freak out when Mom or Dad turns off the light and says good night. Guard against this by talking to your child in advance and offering tips on how she can calm herself down for sleep. Anything from cuddling a teddy bear to listening to a favorite low-key CD can help anxious, overtired kids get the sleep they desperately need. Reinforce positive behaviors. "You want bedtime to be a positive experience for everyone, so set up the situation so that bedtime is not a battle or a time when you are yelling at your child," says Mindell. "Instead, reinforce positive behaviors. For example, tell your child that you'll return for another hug and kiss if she's quiet for five minutes after lights out." Don't forget naps. According to Weissbluth, at age 3 91 percent of kids nap every day; at age 4 50 percent of kids nap five days a week. By age 5 about 25 percent of kids nap about four days a week. But Weiessbluth says to go by your child, not her age. Kids who aren't falling asleep or take a nap that's 35 minutes or less probably don't need it anymore.